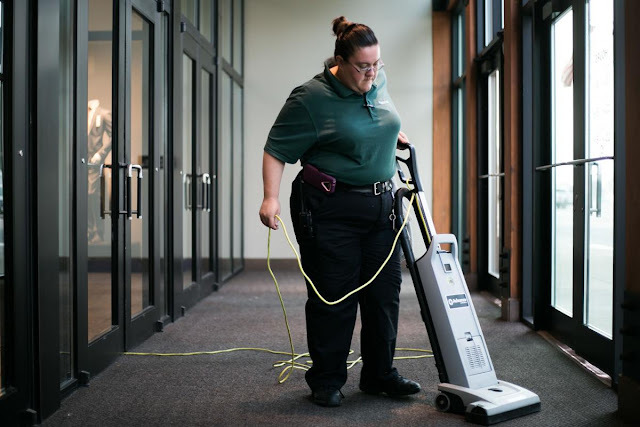 Deanna Hall-Lowe vacuums near the front entrance at the Yakima Valley Mall, in Yakima, Wash. on Tuesday, Aug. 14, 2018. Hall-Lowe has worked for Service Managment-Supplies for nearly five years. At an early age, she was diagnosed with dyslexia and often takes notes in her daily life to understand and perform work duties. A car crash at age 3 left Eddy Garcia with a head injury that led to a developmental disability. Trouble speaking and writing and impaired use of his left hand followed. Today, some would see the 38-year-old Garcia and think he likely wouldn’t have a job. In reality, he’s worked his entire life. But it didn’t come easy. And it’s not getting easier for others like him as disability vocational employment agencies endure a funding crunch. The hard part for Garcia wasn’t the work itself, but finding an employer who would give him a chance. In high school, he worked at Yakima Specialities Inc.’s medical laundry operation. After graduating in 1998, he worked at Goodwill before finally coming to Entrust Community Services in 2005. Yakima Specialties and Entrust are both nonprofit organizations in the Yakima Valley that help people with disabilities find employment. Entrust developed Garcia’s work skills and tracked down job opportunities. He found temporary jobs at Burlington Coat Factory, The Salvation Army, the Yakima County courthouse and other places. A year ago, the Developmental Disability Administration’s Yakima office hired him as an office assistant. Garcia works at the front desk, takes calls and helps office staff. Entrust provides Garcia with continued support. Irma Garcia said Entrust has given both her son and herself strength. She knows little English and found it hard to help her son. She said Entrust opened the door so she could help. Garcia is among hundreds of people helped by employment services for people with disabilities in the Valley. Providing these services is important because many barriers stand between their job-seekers and employment. Terry Archer, supported employment director for Yakima Specialties, said finding employment for his clients is hard because of preconceived notions. “Employers may be concerned about hiring someone with a disability because of concerns with punctualness,” Archer said. In addition to stigmas, many jobs carry a wide set of responsibilities, from working a cash register to stocking and helping customers. She said a client might be able to handle one responsibility but have trouble handling multiple others. These barriers show themselves in employment statistics. Washingtonians with disabilities are employed at less than half the rate of those without disabilities, according to a 2017 annual report by the Washington State Department of Vocational Rehabilitation. About 36.8 percent of working-age individuals with disabilities are employed, compared to 76.4 percent of people without disabilities, according to the report. Carole Rhodes, program director for Entrust, said she expects unemployment rates in Yakima to be slightly higher because of the amount of seasonal retail and agricultural jobs in the region. Nationally, more than 70 percent of individuals with disabilities who are unemployed or out of the labor force report some type of barrier to employment, according to the U.S. Bureau of Labor Statistics. Common barriers include lack of education and training, lack of transportation and the need for job accommodations. In Washington, the Department of Vocational Rehabilitation offers employment help to people with disabilities, though recent funding cuts have curtailed the numbers of people it can actively assist. One thing people with disabilities don’t lack is job dedication. Rhodes said she’s found that people with disabilities can be very loyal. She cited a case where a local Safeway hired five people with disabilities. Those workers now have a combined 75 years of experience, she said. Nine years ago, Entrust approached Ed Aguirre, facility manager for a company that provides janitorial services for the Valley Mall, and asked him if he’d hire a person with a disability. He gave the person a chance. Today, eight people in Aguirre’s crew of 12 have a disability. For his emphasis on hiring people with disabilities Aguirre was awarded Outstanding Employer of the Year by Community Employment Alliance for 2018. He said many of the people he hires need a job coach at the beginning, but eventually are able to do the job without one. He said on occasion a person hasn’t worked out, but that can also happen to people without disabilities. Washington provides employment services for people with disabilities through the Division of Vocational Rehabilitation, a branch of the Department of Social and Health Services. DVR provides its own employment services and often awards contracts to community groups to help. New DVR clients are reviewed for their health and school records and put into one of five different categories based on the significance of their disability, with category one being the most significant and category five the least, said Francisco Felan, vocational rehabilitation supervisor for the Yakima area’s DVR office. Since November 2017, DVR has operated under an order-of-selection in which only people in category one are receiving direct help. Everyone else is placed on a waitlist, Felan said. Felan supervises six counselors ­— four in Yakima, one in Toppenish and one in Sunnyside. Each has about 45 to 60 waitlisted clients. Those on the waitlist can’t get employment services from DVR. They can only be referred to community resources, but DVR can’t pay for those services. Tight funding has been due to rising costs to help clients and the reauthorization of the Workforce Investment Opportunity Act, said Teresa Kutsch, regional administrator for DVR. The reauthorization required DVR to set aside 15 percent of its funding toward high school pre-employment transition services. Operating with an order-of-selection system is nothing new. DVR last worked under the system in 2000 and didn’t return to regular operation until 2006. “In my 30 years (working in this field), this has happened four or five times,” said Carole Rhodes, program director for Entrust Community Services. Like other employment services in the Valley, a portion of Entrust’s caseload is made up of contracts awarded by DVR. Rhodes said order of selection has led to a significant drop in cases. She said this means Entrust has had a harder time keeping people on staff. Martin Cervante, program manager for Elmview, another community services organization that helps people with disabilities, said he’s also seen client numbers drop because of the cutbacks. This article was originally published in the Yakima Herald-Republic.